Once a novelty in the American landscape, views of slim turbine blades sweeping through the air are now familiar as the country aims to increase its production of clean energy. 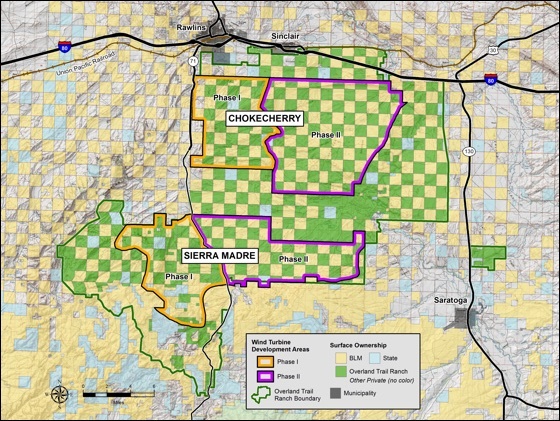 The Chokecherry and Sierra Madre turbines will be installed starting about 3 miles south of Rawlins and Sinclair, Wyoming, on a 320,000-acre ranch owned by an affiliate of The Anschutz Corporation. However, total long-term surface disturbance is estimated to be less than 2,000 acres since wind turbines have a small footprint. Because of their proposed locations, the vast majority of the project’s wind turbines will not be visible from public access points in Carbon County. The CCSM Project wind turbines are being developed in two phases. Wind turbines generally have towers up to 328 feet tall, from base to nacelle, in order to capture more energy per turbine. Aerodynamically-designed blades can be up to 200 feet long. (Final turbine models for the CCSM Project will not be selected until closer to construction.) As wind spins the blades, they power a generator that converts the energy into clean electricity that can be transmitted to utility customers. 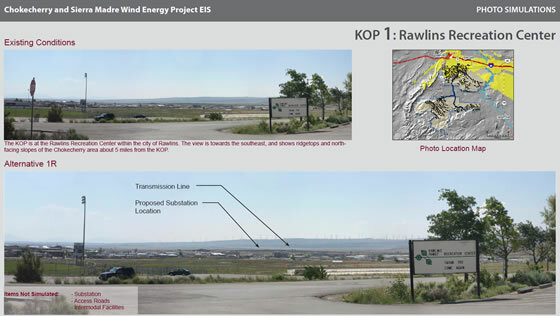 As part of the July 2011 Draft EIS, Bureau of Land Management prepared a series of visual simulations to show what the wind energy project may look like from various vantage points in Carbon County. The visual simulations are available on the BLM website. A visual simulation from the Draft EIS. The U.S. Bureau of Land Management's federal NEPA analysis is available at the BLM CCSM Project website.